​The rolling hills surrounding the rural township of Colfax in Washington State is known as a photographer’s mecca. 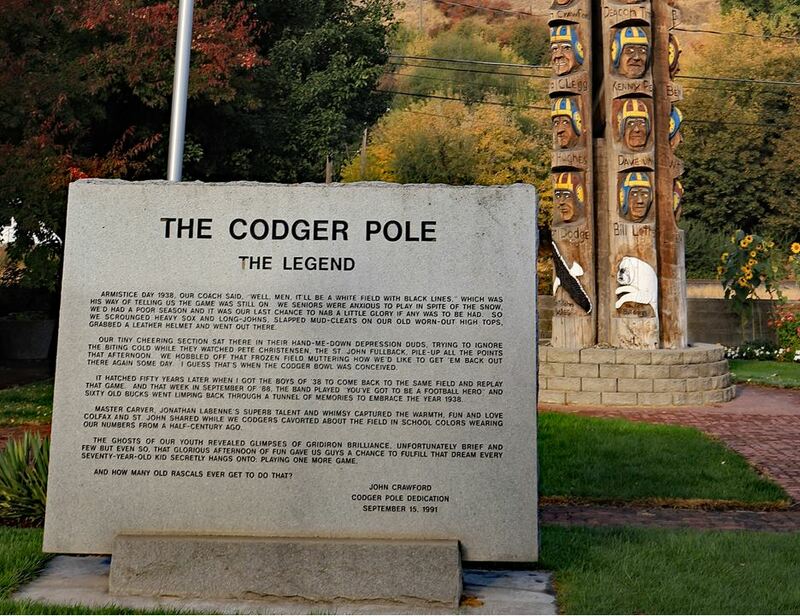 It is also the home of the Codger Pole. The pole stands proudly in the centre of Colfax to commemorate a replay of an American football game played 50 years before. 51 of the original combatants took to the field in what was to become known as the “Old Codgers Bowl” to relive past glories of their youth. ​Following a visit to Colfax last year, Woodside Cricket Club stalwarts Graham Medlow and Patrick Nesbit hatched a plan to hold their own “Old Codgers” game by inviting back to the club past players over the age of 50 to once again showcase their own, if somewhat diminished cricketing brilliance. 49 players answered the call from as far afield as Queensland to partake in the day. Individually numbered caps were presented to each of the players in order of their first appearance at Woodside. In the case of Trevor Hollitt, (cap number 1) he first played cricket at Woodside in the late 60’s before the club was disbanded. 16 of the originals that represented the reformed club in the 1981/82 season made it back to the club, including Cedric Rowlands, Paul Brown and Bill Oliver. The 49 players between them represented WCC 4,380 times, have scored 76,673 runs, taken 3,469 wickets and have a collective 54 premierships. A modified 10 over bash competition was contested between 4 teams of “old codgers”. Two teams represented “Woodside Townies” and two teams of “Out of Townies” represent those that have travelled up “the hill” to play cricket for Woodside. In qualifying games to determine the finalists of the inaugural Codger Bowl, Woodside Blue led by Duane Ireland narrowly defeated Woodside Legends led by Co-captains Graham Medlow and Rick Hill. Out of Townies Blue led by Grant Parker easily accounted for the Out of Townies Red team. In a hotly contested afternoon final the Out of Townies Blue team posted a competitive 94 runs from their ten overs, with Dave Ball smashing numerous sixes much to the delight of the big crowd in attendance. Woodside Townies looked headed for victory but successive wickets to Ball bought the visiting side back into the contest. Superb bowling at the death by Andrew Perkins left the town side needing a six off the last ball for a tie. Current club President Dave Collins couldn’t deliver the telling blow thus handing a jubilant visiting side victory. A superb day of cricket on a beautiful Sunday was only bettered by the opportunity for old friends to once again catch up and renew friendships with a vow to do it all again next year, body willing.